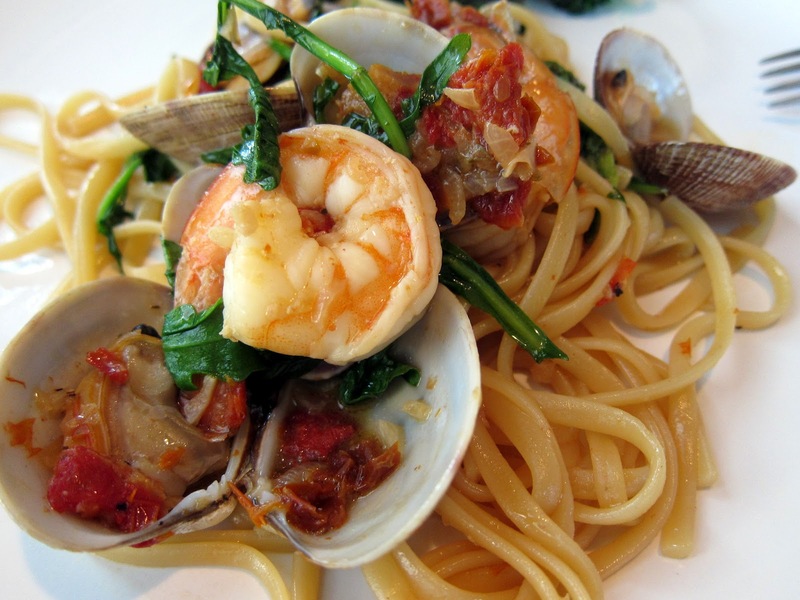 Spaghetti with Pinot Grigio and Seafood – Overworked. Underfed. I don’t know what the seafood consumption of most average American homes is, but in my house growing up, we didn’t eat a lot of fresh seafood. I think my mom would buy a fried fish from the Asian supermarket and then she would cook frozen shrimps, stir fried or tempura style. My mom never bought truly fresh seafood. As a result, I don’t really buy it either nor do I feel comfortable preparing it. I’m just afraid it will spoil the minute I take it home. 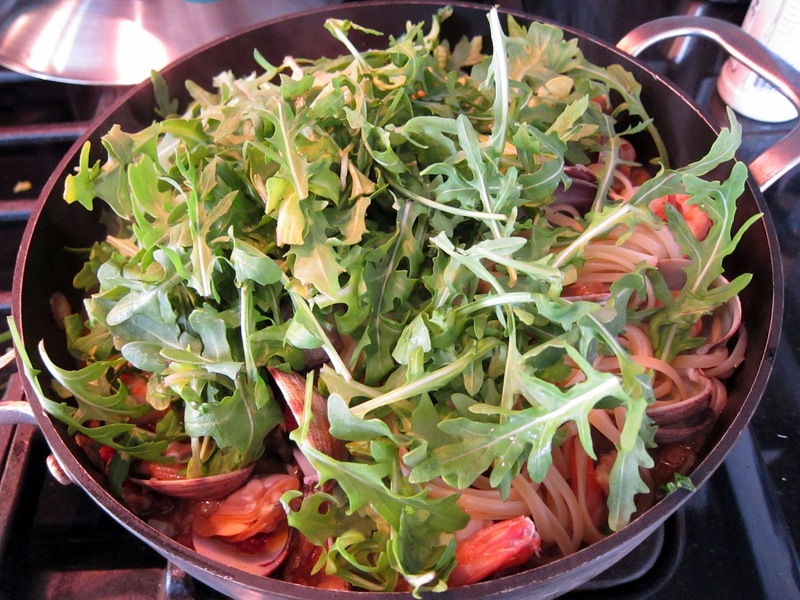 So when I watch cooking shows, which I believe targets the average American household, I am surprised at how often it showcases recipes using fresh seafood. I just cannot fathom that most households can really afford fresh high quality seafood. 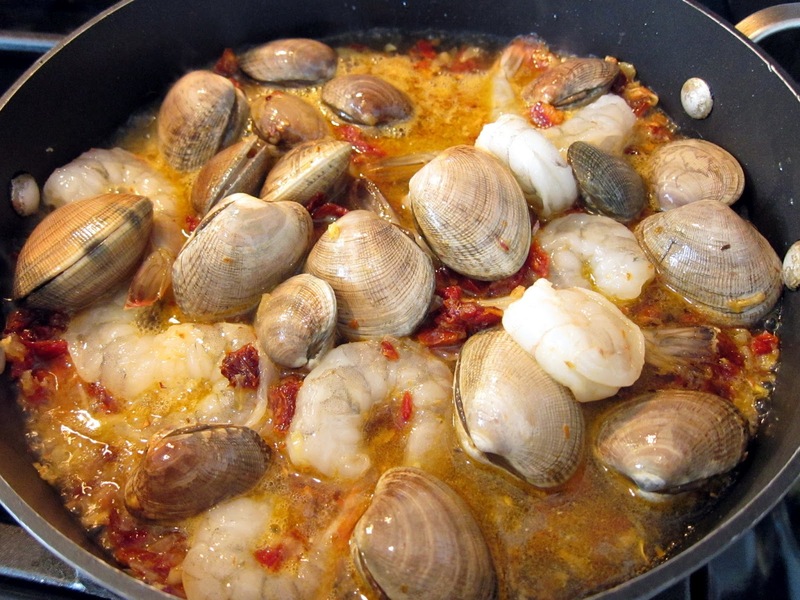 Anyways, I finally had the courage to try out this recipe which calls for clams and shrimp. I learned from my mom that you can get away with frozen shrimp, but with clams there’s only ONE option, fresh and still kicking. I just bought them at the local Asian market so the freshness was questionable to begin with. It was at this same market that I got violent food poisoning from the seafood soon do bu. 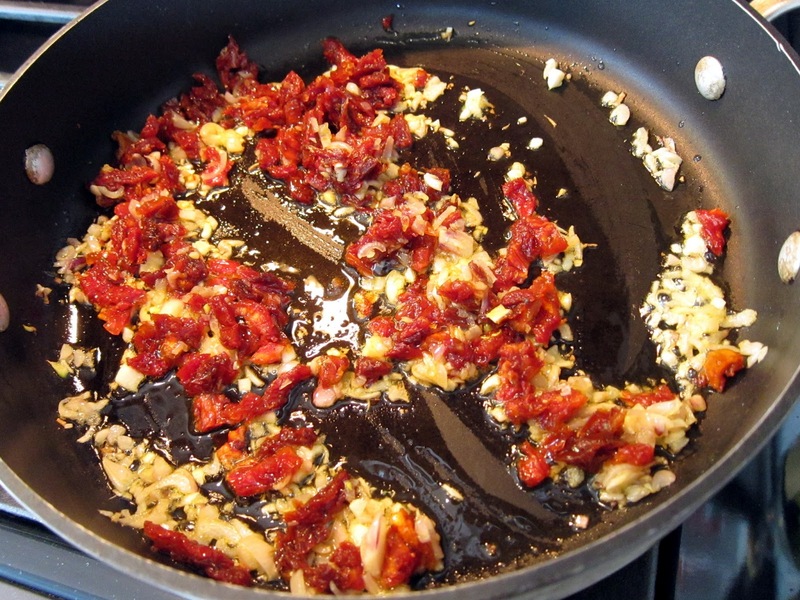 Saute up your shallots, garlic, and sundried tomatoes and deglaze with the wine. Then you add your clams. I was very paranoid about killing my clams since I wouldn’t be cooking them the same day I bought them. I fervently Googled how to store clams, and the worst thing you can do for them is soak them in water overnight. Apparently that will kill them! They’ll run out of oxygen. So I just covered them in a lot of moist paper towels and hoped for the best. I guess I should have taken a picture of the clams after they had all opened, and I mean ALL save one or two! I was amazed that they market didn’t sell me dead clams! Yum, then you toss in the arrugula. Mix it all together and tada! firm to the bite, stirring occasionally, about 8 to 10 minutes. Drain pasta. It was quite the tasty pasta dish, but Dumpling Man wasn’t so impressed with all the seafood. I’ll admit, it wasn’t amazing 3 star Michelin quality seafood, but it was good enough for me and of course, no food poisoning resulted here! Haha. Anyways, I think the best part is not necessarily the seafood, but all the seafood juices making a very delicious sauce.